Something about hair | emma etc. I'm not one for fussy products with my hair or that many products if I'm honest, but I stick to what I know works best. Since I have coloured hair, I need to use a conditioner specifically for coloured hair so the colour will stay as bright as possible. After I first got my hair coloured, I didn't use anything for coloured hair at all, but when I did I noticed a difference. I've talked about this shampoo and conditioner duo before, and wanted to try out the conditioner in the same range but for coloured hair instead. I'd say I would have to prefer the EverPure range over the EverSleek range. But this conditioner makes my hair literally so soft, full of moisture without weighing down and being too oily. The smell is a little old fashioned but smells like rosemary and mint and really comforts me before bed. 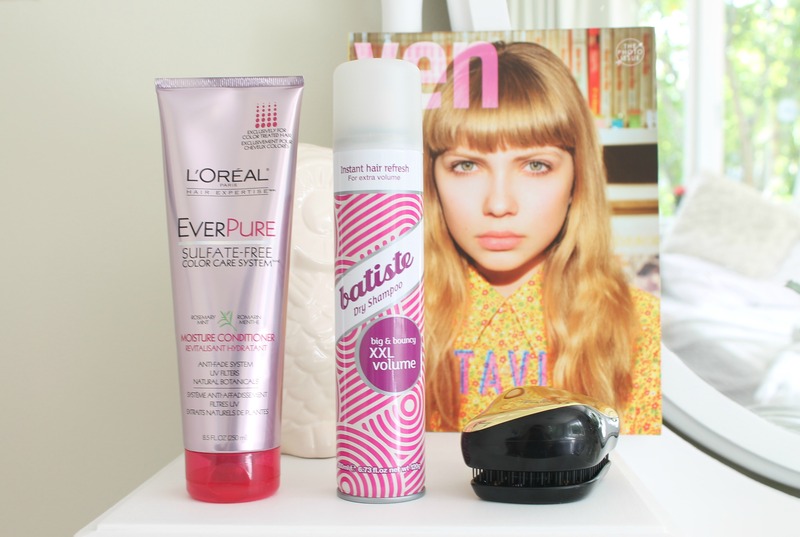 If my hair is getting oily after day old hair, I like to use Batsiste's Dry Shampoo. At the moment I'm using the volume one since I thought I'd try it out, but I prefer the tropical version which I'll be purchasing next time. Usually the bottles run out quite fast for me, although I most likely overuse it, but this one is staying put for a while because I tend to use it sparingly as a little goes a long way. My hair can become sticky and gross if I use too much, but with a few light sprays, a lot of rubbing and brushing out a little bit my hair looks glossy and refreshed. Recently I've purchased a tangle teezer after hearing great things and it is the perfect brush for sorting out your tangles with dry or wet hair. It really is no effort at all to glide this through your locks. I got the gold look compact version for a little more money so this is perfect for putting in your bag or for travelling with since it's small. If I want to give my hair a bit of something extra I will curl a few sections of my hair with the BaByliss Pro Curling Wand which is amazing. You just wrap the hair around the wand and hold, there's nothing else to it. It's also super affordable in my eyes and will last a long time. It's the best thing for curling hair I've used and I can literally do my hair in five minutes. I use a bit of hairspray and I'm finished. If I've curled my hair the day before the next day they'll still be a nice wave there that looks really pretty. Basically, if my hair is looking a bit blah I'll just reach for this curling wand.